Leo Messi and Javier Mascherano’s Argentina kicked off their World Cup bid this Sunday evening at the legendary Maracanã, against Bosnia Herzegovina. The Argentinians, with the two FC Barcelona players in the starting line-up, secured the three points thanks to an own goal from Kolasinac and a brilliant strike from Messi (2-1). Manager Alejandro Sabella surprised when he sent his team out in a 5-3-2 formation. Despite the ostensibly defensive approach, Argentina took the early lead. Leo Messi executed a free kick close to Bosnia Herzegovina’s area and Marcos Rojo managed to connect with the cross. The ball was sent it into the path of Kolasinac who mistakenly knocked it into the back of his own net. The goal was scored on minute 2, fastest own goal in World Cup history. Bosnia Herzegovina, a team that averaged three goals per game during qualifiers, reacted immediately. Even though chances were sparse, the likes of Dzeko, Pjanic, and Lulic threatened Romero’s goal on more than one occasion. Argentina’s defence stood strong, however, and the teams went to the break with 1-0 on the scoreboard. Sabella returned to his preferred formation in the second half with the additions of Gonzalo Higuaín and Fernando Gago. The Boca Juniors player brought fluidity to Argentina’s midfield and a regular supply of forward passes for Messi, Agüero, Di María and Higuaín. Bosnia Herzegovina were undeterred, however, and continued to threaten an equaliser. But on the 65th minute, the Albiceleste doubled their lead. Messi, after beating two defenders, brilliantly rifled the ball into the back of the net from outside the area. With Argentina’s lead doubled, the Europeans desperately tired to claw their way back into the match and they were rewarded for their efforts five minutes from full time. Ibisevic ran on to a through ball and beat Romero with a subtle shot that saw the ball squeak through the keeper’s legs. Both teams enjoyed chances in the final five minutes, but more goals weren’t on the cards. Argentina secured the three points thanks to Leo Messi’s winner. 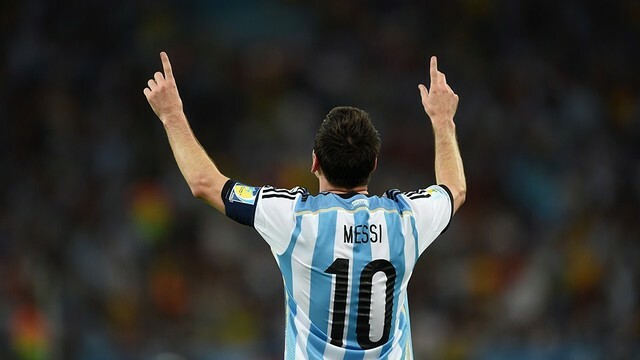 Next Next post: Which three FC Barcelona players have already collected Man of the Match awards at the World Cup?